At first, I thought it couldn't survive outside of a cave environment. Now, I'm not sure. I think it wants to get out. Deep in the Carpathian mountains of Romania, a team of scientists stumble upon the ruins of a 13th century abbey. On further inspection, they make a startling discovery: the abbey is built over the entrance to a giant underground cave system. These scientists are Dr. Nicolai and his associate Katheryn Jannings. Local biologists believe the cave could contain an undiscovered ecosystem, so they hire a group of American spelunkers to help them investigate its depths. Also tagging along is cameraman Alex Kim. Jack McAllister and his brother Tyler are the thrill seeking professional cave explorers hired by the scientists. The two run a world famous team of divers. They arrive in Romania with the latest equipment, including a modified redbreather system allowing a diver to remain submerged for up to 24 hours. The diving team, which includes Charlie, Briggs, sonar expert Strode, and Buchanan, begins its exploration. 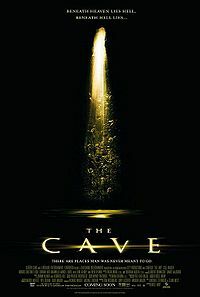 In the cave, they discover bizarre creatures, and also a group of explorers from three decades ago, who are no longer human. The creatures within the movie are the result of a symbiotic parasite from within the cave system. The parasite infects its human host and begins to transform it into a new demon-like humanoid built for surviving in cave systems. They have wings, amphibian skin, echolocation hearing, sharp teeth, and long claws. When the team is attacked by these creatures, they cause a cave-in. As they search for a way out, the creatures stalk and slowly slaughter the team members one by one, and the team must survive each other due to the psychological effects of being underground, and their leader, Jack, is infected with this parasite and slowly semi-devolves into a mutant, but remains with the team until the end. Tyler, Katheryn, and Buchanan are the only ones to escape in the end. However, when the survivors return to civilization and part ways, Tyler discovers that Katheryn is infected and supposedly has the intent to "infect the rest of the world."